Welcome to today’s book blast. I’m so excited to introduce yet another intriguing young adult book. 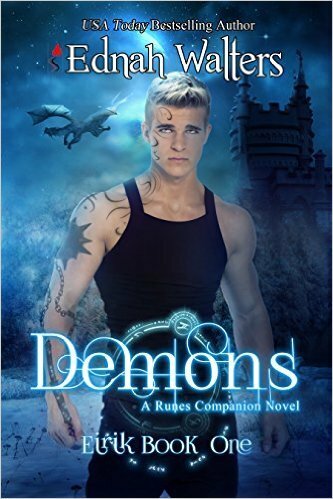 Today’s feature is Demons by Ednah Walters, a companion book to her very popular Runes series. You can read more about the book below and as always, there’s a giveaway at the bottom of the post for your chance to win some extra cash to make sure you never run out of books to read. The man turned the key in the ignition, but nothing happened. Cursing, he kicked the boat. Yeah, genius, that should do the trick. If I could touch or move things, I could find the problem in under a minute and fix the damn thing. Fixing things was one of the perks of being an only child to a man who liked to dismantle and reassemble things. I whipped around at the sounds of rustling and breaking twigs. Two alligators ambled stealthily toward the boater, who was now on land, trying to fix his engine. I’d forgotten about the gators. They were the reason I was here. I hated alligators. Hated their scaly bodies and slitted eyes. Hated that I could see their teeth when their mouths were closed. I couldn’t even explain when my hatred had begun. I just knew I’d always hated them and snakes and lizards and anything reptilian. While my friends’ idea of a horror movie was Poltergeist, mine was Jurassic Park. Eyeing the creepers, I moved from my place by the tree and jumped in their path, heart pounding furiously and fear drying my mouth. The alligators stopped, sensing my essence. Animals were weird that way. The connection between them and Witches was so strong they felt us when more advanced humans couldn’t. My grandmother had been convinced they saw us, too.